During his confirmation hearing Tuesday before the Senate Foreign Relations Committee to become U.S. Ambassador to China, Iowa Governor Terry Branstad had the opportunity to talk about his favorite subject – renewable energy. “Thank you for bringing that up because I’m very proud of where we’ve come from,” Branstad said in response to Sen. Tim Kaine (VA-D) asking about Iowa’s leadership in renewable energy. Iowa will become the first state to generate over 40% of its electricity from wind by the year 2020, and “we produce more ethanol than we consume in gasoline,” said Branstad. The U.S. ethanol industry is looking forward to Gov. Branstad supporting their interests in China with his good friend President Xi Jinping, especially when it comes to expanding the market for ethanol and distiller’s grains. 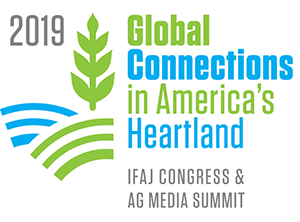 “China has been a top export destination for U.S. ethanol and distillers dried grains, and we look forward to what Branstad can accomplish with China and its people to further develop this marketplace,” said Brian Jennings, executive vice president of the American Coalition for Ethanol (ACE). Iowa Renewable Fuels Association Executive Director Monte Shaw calls Gov. 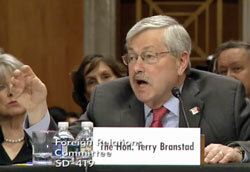 Branstad the “best choice” for ambassador to China. “While we are sad to say goodbye to the longest serving governor in U.S. history and a lifetime champion of renewable fuels, we look forward to working with him to expand trade between the U.S. and China in his new role,” said Shaw.